Day 8: A Strong Day, A Hot Day | Southbound Bulldogs! 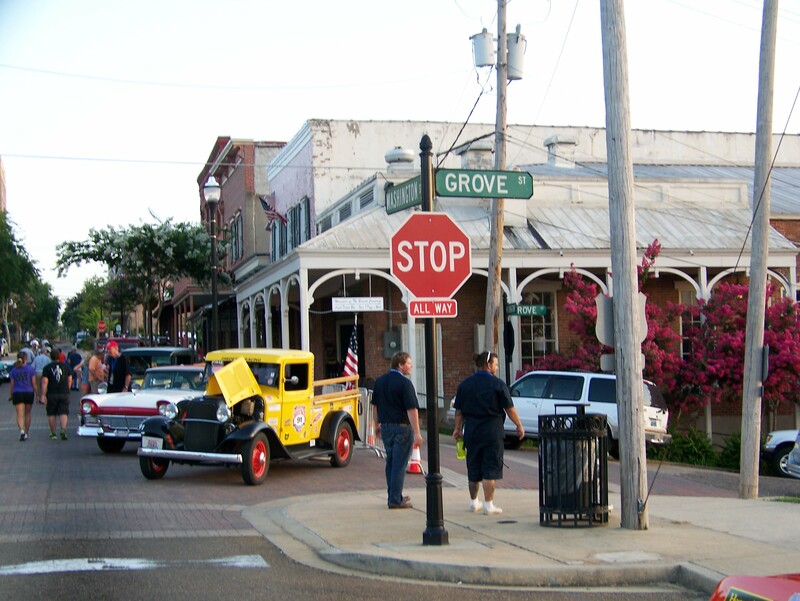 We’ve ventured all the way down to Vicksburg, Mississippi today, and finished fairly strong. Today it was Tony at the wheel, and me navigating. We ended with our best stage score yet, a 25.25 second error. That being said, it was only three legs, so it was naturally going to be lower than normal, but still, we were quite pleased with the outcome. This also means that we are running neck and neck with another X-Cup team from Ponca City, OK for first in class. We’re currently a bit behind. Getting to the finish today wasn’t too difficult as far as obstacles and delays were concerned, but the weather was pretty atrocious. It was sunny, but also miserably hot. At one point this afternoon, I checked the local weather to find that it was 100 degrees out, with a “feels like” temperature of 114 degrees. Once again, we’ve been incredibly thankful to have a car with a hard top. Keeping the sun off us helped keep things bearable, and the cloth seats have saved us from the searing pain that would have come with vinyl upholstery. It ended up being a tough day for drivers having to deal with the heat, as well as many cars. Four cars were picked up by the “vulture wagon” today (the tow vehicle for break downs). Fortunately, our Fairlane has been holding up nicely, even in this heat. It is at this point that I want to give a shout-out to Nik for his contribution to another team in need. 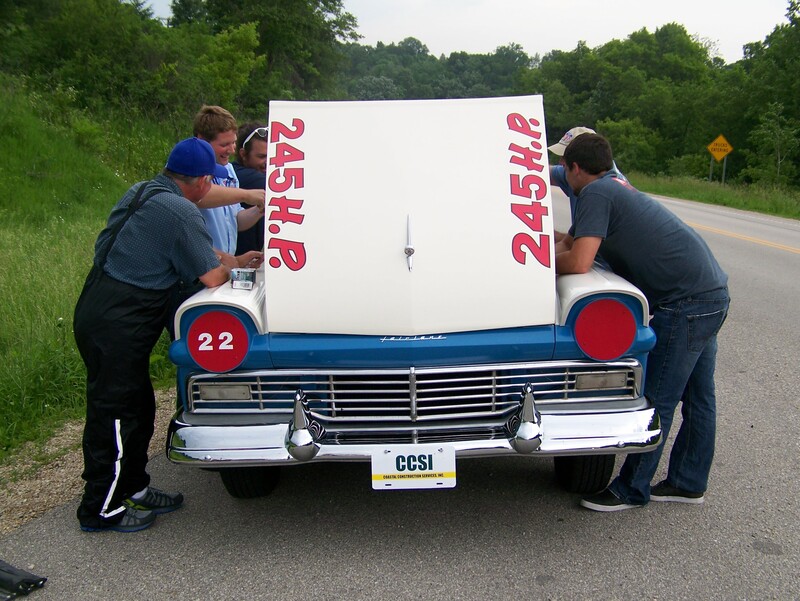 Car 22, the other 1957 Fairlane in the race, had its driver drop out for the day due to the heat. The navigator asked if one of us would volunteer to fill the navigator spot while he filled the driver spot to finish the stage. Nik readily obliged, and he navigated in the much hotter, much noiser, number 22 Fairlane for the entire afternoon session. Fortunately, when he rejoined us at the finish, he seemed to still be in good spirits, and also seemed to be sporting a darker tan than earlier in the day. 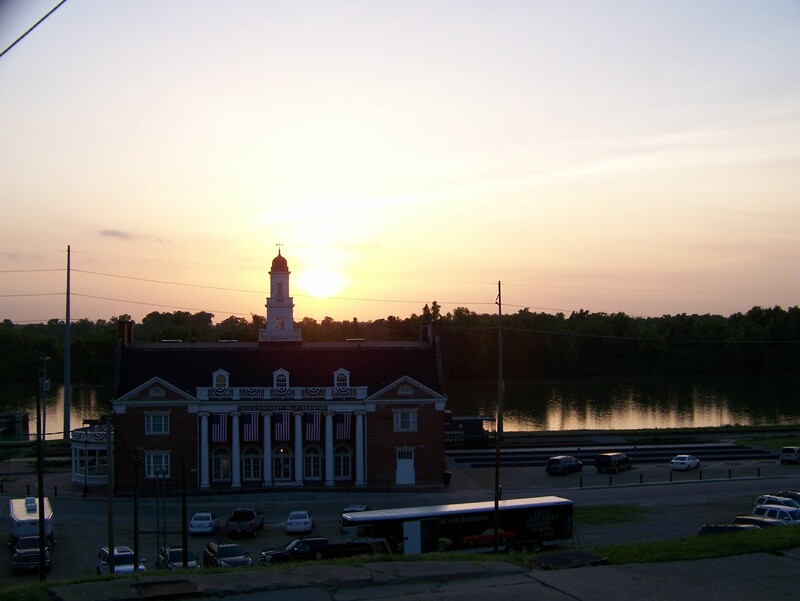 We finished today’s stage at a picturesque riverfront in Vicksburg, with the sun setting over the river, and some live music playing over the crowd. Perhaps best of all though, we got to have dinner in the air conditioning! We’ve only got three days left after today, and they’re sure to go by quickly. But we plan to make the most of them, and to keep working on our times. And you’ll be sure to get the details here and on Facebook. Hmm…doesn’t seem but a couple of weeks ago I heard complaints it was cold! So visualize McPherson in winter…..maybe it will help the heat 🙂 Good job and good Karma for helping out! I’d say the fact that the car ran flawlessly under Baja 1000-like conditions speaks to talent of the mechanics who did the prep work. As I wipe a tear from eye, I have to say how proud I am of you guys. First class mechanics and gentlemen as well. Perhaps we should turn this into an eligible bachelor-type reality show when the race is over?